Road safety is a critical issue for all communities. Most have been affected by injury or death on roads, and all will experience risks on roads. Often these dangers affect the wellbeing and lifestyle of local residents, restricting their ability to get around safely using active and sustainable means. There are many ways to improve road safety, from encouraging local drivers to slow down, to working with authorities and partners to achieve road engineering measures. Road Safety Week is an ideal opportunity to get local people together, and team up with local agencies and organisations, to reduce road deaths and injuries and work towards safer roads for everyone. If you work in road safety year-round, Road Safety Week is an opportunity to work with partners to reach a wider audience and gain valuable publicity for your work and the messages you’re promoting. It’s a chance to focus everyone’s attention on making roads safer. STEP ONE: Check if there’s a RSW where you are, and if not set a date! Check our Road Safety Week map to see if there is a Road Safety Week you can take part in in your country or region, or contact your local or national authority. You can also use the map to browse case studies for ideas and information from existing Road Safety Weeks around the world. If there is already a Road Safety Week in your country or region, put the date in your diary and plan how you can take part. Use the ideas below, plus any guidance provided by your national/regional organisers, to help you get involved. If you don’t have an existing Road Safety Week where you are, you can organise your own using the advice below, on a week of your choice. We suggest planning your event at least two months in advance, ideally more, choosing a week when you and your partners and participants won’t be too busy. If you are planning to work with local schools, make sure you choose a week that isn't during or immediately after vacations or in the run-up to exam times. Other partners you may want to work with (and therefore consult on timings) are outlined under step five below. Bear in mind that if you work with (or are part of) a regional authority or organisation, they may be able to spread your Road Safety Week to more people across a wider area, by encouraging schools, community groups and organisations across a whole region to get involved, and by running a publicity campaign promoting road safety. You might even be able to influence national authorities or organisations to run the Week nationally (see our guide for governments and NGOs for advice on this), so think BIG - the more people you can get involved in Road Safety Week the better! Whether you’re taking part in an existing Road Safety Week or organising your own, it’s a good idea to consider in advance what road safety issue you will focus on, what you’re aiming to achieve and therefore what messages you want to promote and to whom. If you’re taking part in an existing Road Safety Week, find out if there is a theme that might be relevant for you. To help you choose your focus, consider what are the main risks people in your area face on roads, and if there are barriers to them getting around safely, sustainably and healthily. For example, you may be worried about children on foot having to walk or cycle along and cross over busy, fast roads to get to school or around the area. Or you may be concerned that drivers, or young drivers in particular, are driving too fast or while on their phones, putting people in danger. Or you might want to campaign for a specific measure, such as a lower speed limit or safe pavements and paths. To help you decide your focus, you could survey local people, or a particular group like parents, drivers, young people or children (see our sample ‘hands-up’ surveys for 5-11 year olds and 11-18 year-olds for use in schools) on their views and experiences in relation to road safety in the area. It’s also a great way to get everyone thinking about road safety and start promoting your Week. You could also carry out a road safety audit of your area. For more ideas, explore the resources on this site, the fact pages on Brake’s UK website, or previous themes used by Brake for Road Safety Week UK in 2014, 2013, 2012 and 2011. You could also consider using the Brake Pledge, or focusing on one of the Pledge's six points. The Pledge outlines key promises drivers and everyone else can make to help protect themselves and others, so it's ideal for using through an awareness-raising campaign. You'll find more detailed guidance on developing a theme and messaging in our publicity and media guide. Whether you’re taking part in an existing Road Safety Week or organising your own here are some simple ways to get life-saving messages to local people and campaign for safer streets. If you're planning to coordinate your Week across a large area, involving lots of schools, groups and organisations, see our page for governments and NGOs, for advice on promoting involvement more widely. Print and put up road safety posters or display banners in your community, such as on noticeboards and in shops, community centres, libraries and schools (with permission). Include a feature on Road Safety Week in a community bulletin, newsletter or website, promoting your theme and messages. 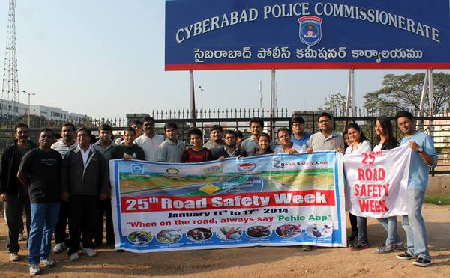 Use our Road Safety Week logo or web banners alongside the article. Encourage members of the community to sign the Brake Pledge committing to use roads as safely as possible. The Pledge can be used online, in communications, in presentations, at events and on stands in public places. Run road safety workshops with local drivers, young people, or families, organised with local employers, colleges or community/health centres and clubs. You can explore topics such as those covered in the tools & resources section of this site. Make use of tools such as Brake’s stopping distance activity and morning-after calculator, road safety videos on the tools & resources pages, and/or the Brake Pledge. Attend a free Brake webinar on how to deliver Pledge workshops to drivers. Encourage local commuters and families to leave their cars at home and use an alternative mode of transport for a day, or the week. Provide advice and support on using public transport and walking and cycling, like publicising local bus routes, running free bicycle maintenance checks, or providing pedometres. You may be able to work with a local transport company to offer discounted public transport use for the week. Help schools and colleges organise road safety assemblies, projects and campaigns. Invite schools along to any events you are running and coordinate educational activities and creative projects for the children. See our teaching guide for ideas. Run a competition for local children or young people to create a road safety banner, poster or advert, linked to your theme. Offer prizes and arrange for the winning entries to be displayed in a public place or screened at a local cinema or outdoor screen. Engage local businesses, and help/encourage them to promote safe driving to employees. See our company page for ideas. You'll find more detailed advice and ideas on raising awareness through communications, materials, social media and traditional media in our publicity and media guide. A march or a public meeting with members of the local community holding up signs calling for road safety improvements, and involving local politicians. This will draw attention to your cause and publicise your Week within the community. A meeting between community members and local officials, such as council and police representatives, to discuss working together to tackle road safety problems. A petition for a particular safety measure, promoted online and through noticeboards/displays in local shops and libraries. A joint letter to your local government agency (with responsibility for roads) from all the schools in your area, calling for safer streets for children. A launch event for your campaign, or a new community group focused on raising awareness of road safety and improving safety on local roads. See our publicity and media guide. Promote your campaign in local newspapers, radio and TV by telling journalists about it over the phone or through a press release, explaining what you’re calling for. You could organise a ‘photo call’, inviting photographers from newspapers to take photos of local people holding up a banner calling for safer roads. Read our publicity and media guide. For more advice on running a campaign calling for local road safety measures, see Brake’s guide to community campaigning. Whatever you’re planning, make use of resources to support and promote your activities and get important road safety messages out. Free downloadable posters and other tools are available on our tools & resources pages, plus you'll find advice on developing your own materials in our publicity guide. The Brake UK shop can also deliver Road Safety Week branded resources internationally including t-shirts, balloons and posters, to help you let everyone know it’s your Road Safety Week. If you are organising a Road Safety Week as part of an existing national or regional Week, check if the national or regional organisers have resources available. Partnerships are a great way to pool resources and promote road safety more widely. 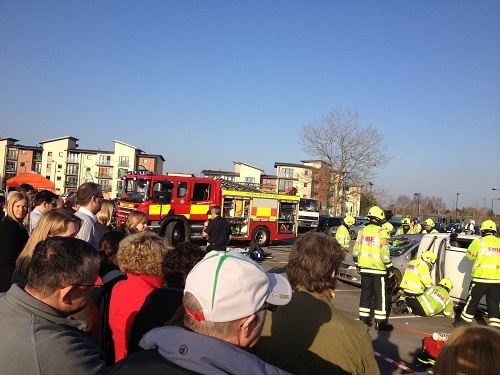 Partners who work in road safety or experience the aftermath of road crashes, such as local authority road safety teams, emergency services and health professionals, may be able to deliver educational talks, training, resources and support organising larger events. Other partners, such as employers, schools, colleges, sports and youth clubs and community groups, may be able to help you engage a wider audience, such as by hosting activities, promoting your campaign messages, or organising their own activities with advice and guidance from you. It’s a good idea to get in touch with potential partners early on, while planning your activities, to find out if and how they can get involved, and give them plenty of notice. They may also be interested in inputting into your theme and the type of activities you organise. See the other guidance pages on this site for companies and schools for ways these partners may be able to get involved and work with you. 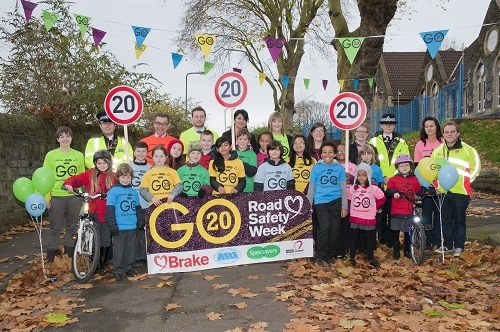 Partners like regional and national authorities might also be able to spread your Road Safety Week across your region or even country, by encouraging other community groups, schools and organisations to take part, and running a big publicity campaign. Encourage partners like this to use our guide for governments and NGOs on how to do this. Putting up posters with the date of your Week and promoting road safety messages where people will see them, such as on noticeboards and in shops, community centres, libraries and schools. You can use Brake's Road Safety Week poster with space for your date. Displaying web banners and adverts on relevant websites used by local people, such as local business and local authority sites. Create your own or use one of Brake's downloadable banners. Including an article in your community bulletin/newsletter/website. Download Brake's Road Safety Week web banner and Road Safety Week logo for use in your communications. Setting up a dedicated web page, Facebook page or website explaining what the Week is about and how people can get involved. Promoting the Week through social media, encouraging local people to give their views and suggestions on road safety, and share/retweet information about the Week to their contacts. Surveying members of the community on their views on road safety in advance, letting them know it’s part of the preparations for the Week. Contacting potential partners as above, and encouraging them to publicise the Week to their students, members, customers or contacts. Sending a press release to and/or contacting local media a week or two in advance to let them know what’s happening. See Brake's guide on publicity and the media. As well as doing the above in advance of your week, it's a great way to get key road safety messages out to as many people as possible if you can carry out more publicity like this during the Week itself, and afterwards letting everyone know how it went. For more detailed advice on this, see our publicity and media guide. Taking pictures of and filming your activities, and disseminating these images and clips afterwards, will help show how your Road Safety Week has been a success and promote next year’s event. Make sure you get appropriate permission from people in pictures and film clips before using these, and permission from parents for children to be filmed or photographed (if working with schools, they may already have a policy and permission form for this). Evaluating your Week will give you an indication of its reach and success, and what worked well and not so well, to help you plan for future years and continue to engage partners. It's a good idea to record what you do as you go along, and build in evaluation methods to your delivery of the Week, ensuring you can measure success against your aims. As well as recording what activities you have run, and any run by partners, and the reach and levels of involvement in these, you could also assess the amount of publicity achieved, and gather feedback from people in the area, people who have taken part in your activities, partners and anyone else involved. You could do this by sending a simple feedback survey to each of these groups, for example asking them to tell you what activities they were involved in or what communications they came across (as relevant), and to rate information and activities, and make general comments about how it went and suggestions for future Weeks. You may be able to use a free online tool to do this like surveymonkey. Once you've carried out an evaluation of your event, communicate your successes - including metrics and examples of the activities that took place and comments from participants. You could present this in a short evaluation report (see Brake's RSW UK evaluations for example), or as a page on your website or in your newsletter, and then share this with local people, partners, participants and anyone you're hoping might get involved next year. We would appreciate it if you can also tell Brake how it went by filling in our short form. We are keen to find out about Road Safety Weeks around the world and share the experiences and ideas of organisers and participants. We may contact you to ask if we can include your example as a case study on this site. Road Safety Week is great for focusing everyone’s attention on road safety, but it should be a priority year-round, so use the experience of running your Road Safety Week to consider how you can continue promoting road safety. It’s also a good idea to set the date for your next Road Safety Week as soon as the last one is over, so you can start planning what you could do next year well in advance.